Original Editors - Elizabeth Bohnert from Bellarmine University's Pathophysiology of Complex Patient Problems project. Addison’s disease is another name for primary chronic adrenal insufficiency. 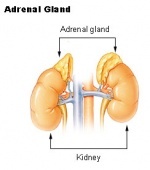 It is a condition where the adrenal cortex (the outer layer of the adrenal gland that produces mineralocorticoids, glucocorticoids, and androgens) is progressively destroyed, resulting in decreased secretions of the hormones. Cortisol, a glucocorticoid, and aldosterone, a mineralcorticoid, are the primary hormones that are decreased with this disease, causing body wide metabolic disorders and fluid imbalances. 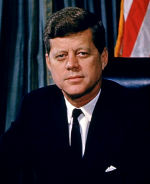 President John F. Kennedy is the most widely known person who was believed to have suffered from Addison's disease, easily noting the bronze coloring of his skin in photographs. Prior to diagnosis, he was so ill that he collapsed during his final campaign event for the House of Representatives, being described as "sweating heavily and his skin being discolored." When he was properly diagnosed, doctors gave him the prognosis of no more than a year to live. Addison’s disease occurs in about 4 out of 100,000 Americans each year. Even though it is seen throughout the lifespan in both genders, it most commonly occurs in middle-aged white females. Addison's disease can occur alone, or it can occur along with other autoimmune disorders, leading to polyendocrine syndrome. Osteoporosis is more common among people with Addison's disease compared to healthy individuals because of the medical management with long-term steroid replacement therapy. Steroids have several effects on bones including increasing osteoclastic activity, decreasing osteoblastic formation, and decreasing the absorption of calcium in the intestines. Adrenocorticotropic Hormone (ACTH) Stimulation Test: This is the most common test performed in diagnosing Addison's disease. Blood cortisol and/or urine cortisol levels are measured following being administered with a synthetic form of ACTH. Normally cortisol levels will increase following the administration of the synthetic ACTH. However, patients with Addison's disease experience little or no increase in cortisol levels following the test. Diagnostically significant levels are elevated ACTH levels (≥ 50 pg/mL) with low cortisol levels (< 5 μg/dL [< 138 nmol/L]). Corticotropin-Releasing Hormone (CRH) Stimulation Test: This test is performed when there are abnormal results from the ACTH test. In this test, blood cortisol levels are measured 30, 60, 90, and 120 minutes following an intravenous injection of synthetic CRH. Patients with Addison’s disease will have increased levels of ACTH but no cortisol. X-ray or ultrasound of the abdomen may be performed following laboratory tests to determine if calcium deposits exist in the adrenal glands. There are a number of causes for Addison’s disease, however “90% of all cases are attributable to one of four diseases: autoimmune adrenalitis, tuberculosis, the acquired immune deficiency syndrome (AIDS), or metastatic cancers.” The primary sites of the metastases to the adrenal glands usually arise from carcinomas of the lungs or breasts. Unfortunately, there is very little information and research pertaining to the physical therapy management of patients with Addison's disease. The APTA's Hooked on Evidence yielded not a single article with the term "Addison's disease." Then EBSCOhost, GoogleScholar, and ProQuest were all used with the search terms "Addison's disease" and "physical therapy" or "exercise" and there was only one pertinent journal article. Jakobi et al found that women with Addison's disease had similar maximum voluntary force of the quadriceps muscle compared to the control group of health individuals, however they had "altered contractile properties and decreased endurance compared with controls." Obviously, more research needs to be performed to determine the proper interventions that physical therapists should utilize to treat patient's with Addison's disease and also determine any limitations to treating these patients. Monitor for the signs of an impending addisonian crisis, which includes "dizziness, nausea, profuse sweating, elevated heart rate, and tremors or shaking"
Ingestion of Heavy Metals: Excessive ingestion of heavy metals (such as arsenic poisoning) may lead to hyperpigmentation that is also seen with Addison's disease. However, this discoloration of the skin ceases when the source of the exposure is removed. Hemochromatosis: This is the most common form of iron overload. 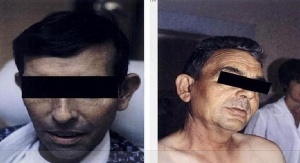 One of the common signs of this disorder is abnormal pigmentation of the skin, appearing gray or bronze. Commonly, it occurs with damage to many organs including the pancreas, the liver, and the thyroid gland. If left untreated, this may in turn lead to damage of the adrenal glands. Peutz-Jeghers syndrome: This inherited disorder is also characterized by melanin spots in the oral mucosa, the lips, and the digits. However along this disease, patients develop polyps in the gastrointestinal system leading to abdominal cramping and blood in the stool, which are all not found in Addison's disease. Malignant Melanoma: This cancer is the most serious type of the skin that develops in the melanin producing cells of the skin. The primary cause of this form of cancer is due to overexposure from the sun, and begins with changes in an existing mole or the development an unusual looking mole. One should be sure to examine the moles according to the A-B-C-D-E guide developed by the American Academy of Dermatology: A=asymmetrical shape, B=irregular border, C=changes in color, D=diameter, E=evolving. Hypothyroidism: This refers to a deficiency of the thyroid hormone leading to a generalized decrease in metabolism. One of the most common signs of this disorder is the feeling of fatigue and sluggishness. However, it is common that people with this disorder experience weight gain, while patients with Addison's disease will lose weight due to the vomiting and anorexia. Acanthosis Nigricans: This is a skin condition characterized by dark, thick skin located around the skin folds of the body. This disease is common in conditions where there is an increase in insulin, such as in diabetes. Hypopituitarism: This results from decreased hormone production by the anterior pituitary gland. 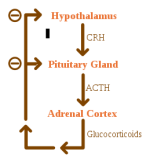 Since ACTH is a primary hormone of the anterior pituitary, it is not released, thus decreasing the stimulation of the adrenals to release cortisol. Since there is a similar decrease in cortisol, this disorder has many of the common symptoms of Addison's disease, such as hypoglycemia, anorexia, nausea, and lethargy. ↑ 1.0 1.1 1.2 1.3 1.4 1.5 1.6 1.7 1.8 Goodman CC, Fuller KS. Pathology: Implications for the Physical Therapist. St. Louis: Elsevier; 2009. ↑ 2.0 2.1 2.2 2.3 2.4 2.5 2.6 2.7 2.8 2.9 Kumar V, Abbas AK, Fausto N. Pathologic Basis of Disease. Philadelphia: Elsevier; 2005. ↑ 4.0 4.1 4.2 4.3 Goodman CC, Snyder TE. Differential Diagnosis for Physical Therapists: Screening for Referral. St. Louis: Elsevier; 2007. ↑ 5.0 5.1 5.2 Winqvist O, Rorsman F, Kampe O. Autoimmune Adrenal Insufficiency: Recognition and Management. BioDrugs. 2000; 13(2): 107-114. ↑ Adachi JD, Bensen WG, Cividino A. Corticosteroid-Induced Osteoporosis. JAMWA. 1998; 53: 1-7. ↑ Jakobi J, Killinger D, Wolfe B, Mahon J, Rice C. Quadriceps muscle function and fatigue in women with Addison's disease. Muscle Nerve. August 2001;24(8):1040-1049. ↑ Ibrahim D, Froberg B, Wolf A, Rusyniak D. Heavy Metal Poisoning: Clinical Presentations and Pathophysiology. Clin Lab Med. 2006; 26: 67-97. ↑ 14.0 14.1 14.2 Liotta EA. Addison Disease: Differential Diagnoses Workup. emedicine. 2009. Available at: http://emedicine.medscape.com/article/1096911-diagnosis. ↑ Sharma D, Mukherjee1 R, Moore P, Cuthbertson DJ. Addison’s disease presenting with idiopathic intracranial hypertension in 24-year-old woman: a case report. Journal of Medical Case Reports. 2010; 4(60). ↑ Bergthorsdottir R, Leonsson-Zachrisson M, Oden A, Johannsson G. Premature Mortality in Patients with Addison’s Disease: A Population-Based Study. The Journal of Clinical Endocrinology & Metabolism. 2006; 91(12): 4849-4853. ↑ Abdulhamid I, Saadeh S, Cakan N. A three-year-old boy with X-linked adrenoleukodystrophy and congenital pulmonary adenomatoid malformation: a case report. Journal of Medical Case Reports. 2009; 3: 9329.